The WUF-100J ultrasonic flow meter is designed to measure the fluid velocity of liquid within a closed conduit. The transducers are a non-contacting, clamp-on type, which will provide benefits of non-fouling operation and easy installation. The WUF-100J transit time ultrasonic flow meter utilizes two transducers that function as both ultrasonic transmitters and receivers. The transducers are clamped on the outside of a closed pipe at a specific distance from each other. The transducers can be mounted in V-method where the sound transverses the pipe twice, or W-method where the sound transverses the pipe four times, or in Z-method where the transducers are mounted on opposite sides of the pipe and the sound crosses the pipe once. This selection of the mounting method depends on pipe and liquid characteristics. The ultrasonic hand held flow meter operates by alternately transmitting and receiving a frequency modulated burst of sound energy between the two transducers and measuring the transit time that it takes for sound to travel between the two transducers. The difference in the transit time measured is directly and exactly related to the velocity of the liquid in the pipe. WUF series Handheld Ultrasonic Flow Meters are based on clamp-on transit-time flow measurement principle. It measures the flow rate of liquid in a pipe from outside of the pipe by using a pair of ultrasonic transducers. In general, the liquid should be full in the pipe, and should contain very little particles or bubbles. It is applicable for water (hot water, chill water, city water, sea water, etc. ); sewage; oil (crude oil, lubricating oil, diesel oil, fuel oil, etc. ); chemicals (alcohol, acids, etc. ); waste; beverage and liquid food, solvents and other liquids. WUF-100J handheld ultrasonic flow meter is a battery-powered ultrasonic flow meter with the capability of a full-size flow meter. It is carefully designed for portability and ease of use. 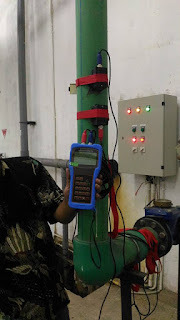 WUF-100J portable type ultrasonic flow meter adopts built-in chargeable nickel-hydrogen batteries, which can work for about 20 hour after fully charged. It adopts intelligence charging method. The operator should insert one end of the configured power wire into the AC 220V port of the right side of the machine, and inserts the other end into the electrical outlet (AC 220V), and then the charging operation could be finished. After connecting the wires, the red light on the keyboard of the machine will glitter , which means it’ s charging. When it is fully charged, the red light will turn to green. Then the operator can pull out the wires and put away for nest use. 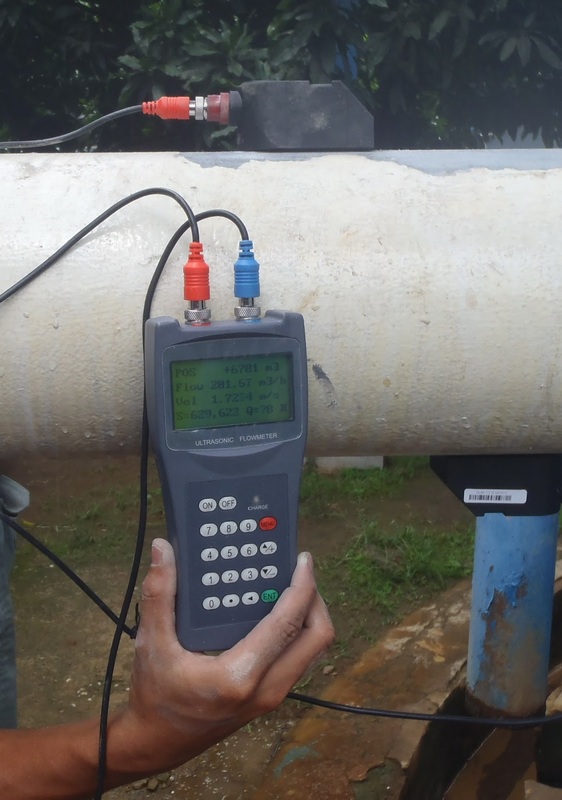 The WUF-100J portable ultrasonic flow meter can be virtually applied to a wide range of measurements. The measured pipe ranges 20-6000 mm [0.5 - 200 inch]. A variety of liquid applications can be accommodated: ultra-pure liquids, potable water, chemicals, raw sewage, reclaimed water, cooling water, river water, plant effluent, etc. Because the instrument and transducers are non-contacting and have no moving parts, the ultrasonic flow meter can not be affected by system pressure, fouling or wear. Standard transducers are rated to 110 ºC. Higher temperatures can be accommodated. For further information, please consult the manufacturer for assistance. All user-inputted configuration values are retained in the built-in non-volatile flash memory that can store them for over 10 years, even if power is lost or turned off. Password protection is provided to avoid inadvertent configuration changes or totalizer resets. A time-keeper is integrated in the ultrasonic flow meters for the index of date totalizing and works as the time base of flow accumulation. The Ultrasonic flow meters keeps operating as long as the battery’s terminal voltage is over 1.5V. In case of battery failure, the time-keeper will not keep running and it will lose proper time values. The user must re-enter proper time values in case the battery becomes totally exhausted. An improper time value affects no other functions but the date totalizer.